If any one still occasionally glances at my blog in the hope I have written something, I am sorry that it has been so long since my last post. Unfortunately my cable that I use to transfer my photos to the lap top decided not to work anymore. I am pleased to say I now have a new one and can now share what I have been up to over the last few weeks. Today's post is about the sewing projects that I have worked on during the month of October. 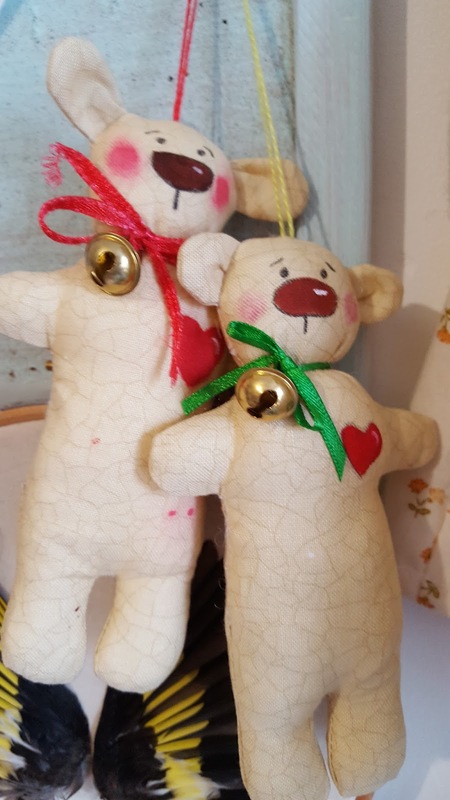 The little bears are about 4 inches high they are really fiddly to make because they are small but they are so cute. I added red or green ribbon and a tiny bell around their neck as I hope to hang them on my Christmas tree. Tiny bears with big hearts. The prairie stars was doing the rounds on Facebook, a free PDF pattern from no cape mom. who can resist free patterns. 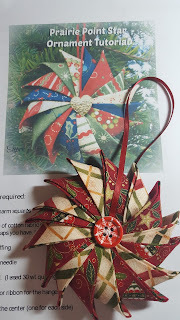 I have adapted mine in size as the original is made up using a 5in charm pack, finished star 6in. My prairie star measure 3 1/2 inches and are available to purchase on my website. Prairie point star Christmas decoration. 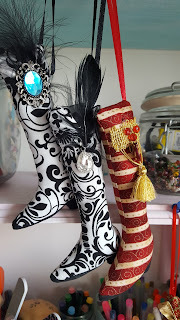 The Victorian ladies boots I have made before as gifts for friends and family. They are adapted from a Tilda pattern for a little ice skate. My favourite part is deciding what embellishments to add to them. Victorian boots with beautiful embellishments. Up cycling costume jewelry into new decorative pin broaches. 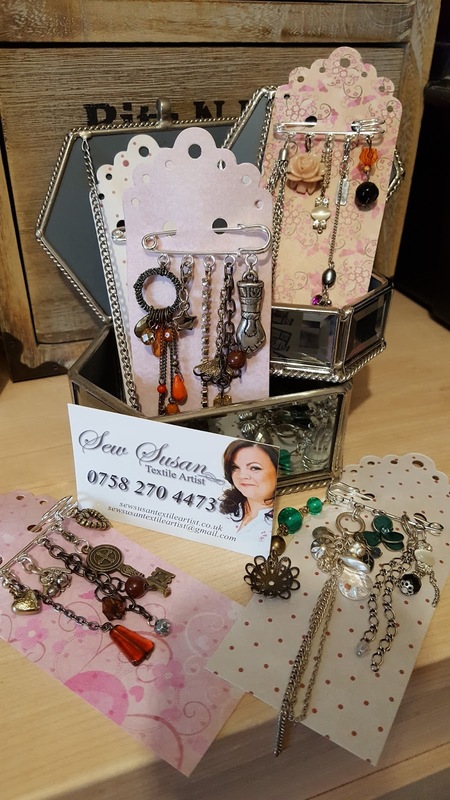 I have been collecting unwanted and broken costume jewellery for some time now as it great to use as embellishments. I recently purchased a pack of kilt pins that had little loops where I could attach beads and chains I am not a jewellery artist and it was a bit of a learning curve but I think they turned out great. 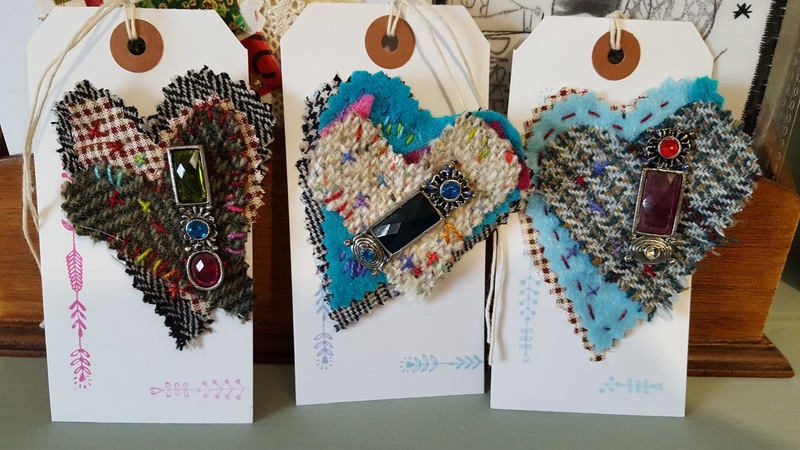 The heart broaches are made up of wool.felt and cotton. Embellished with embroidery thread and jewels and an absolute pleasure to make. Both are available to purchase on my website. 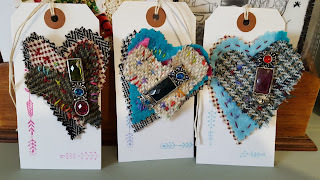 Wool, felt and fabric bejewelled heart broaches. Floss made from Melly & Me Floss and Pocket pattern. Finally, these two beautiful bunny girls are made from a pattern I purchased from Melly & Me. The pattern is called Floss and Pocket. 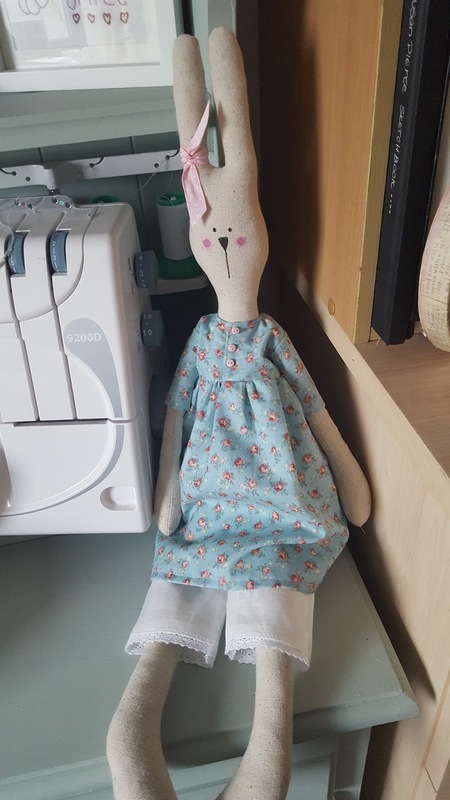 Pocket is a boy rabbit but when I went through my fabric stash I didn't have any fabric suitable to make Pocket's dungarees. 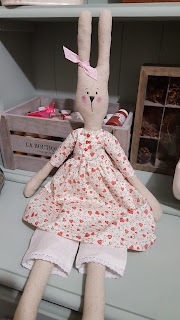 However, I have plenty of fabric that makes beautiful dolly dresses so Tilly Patch was born. I am not sure if I will make Pocket but then again it is the perfect excuse to go fabric shopping! My goodness, you’ve been busy making all kinds of beautiful things!